Low volume production can double up two process on one piece of equipment. 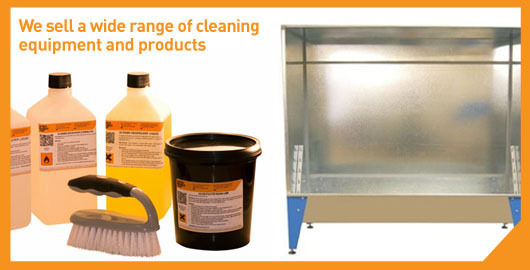 A flash dryer or a hand curer can be used for drying between colours AND curing. 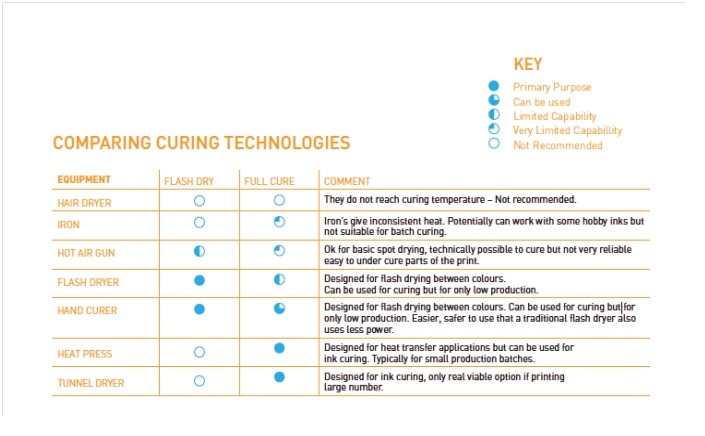 It can be difficult deciding what equipment to buy for flash drying and curing your prints. We know that your budget can also dictate what type of curing equipment you have. So to help you decide, we put together a quick guide to what works and what doesn’t when flash drying and curing your prints. Starting at the top is the lowest cost option right through to the higher end of heat presses and tunnel dryers. Although the entry level range for these machines can be extremely cost effective. Mesh Count – Which one? Which Mesh Count Should I Use? We get lots of questions about mesh count, below are just two from our FAQ’s and on our free Buyers Guide we go into more detail. Getting the right mesh count is like getting the right squeegee and the right ink for the job in hand. These are ALL really important and make the difference to your finished product. Remember what you are trying to do is push the ink through the mesh on to the substrate. So the wrong mesh will result in too much or too little ink getting through. Not good. A very detailed design on a coarse mesh won’t work either. Check out our range of screens and mesh. If you ever want advice on which one to buy please contact us. we will be more than happy to talk you through it. What is the difference between the mesh counts different meshes on the screens? A lower number means a coarser mesh count, a higher number means a finer mesh count. You will need to select the correct mesh count for the artwork you have produced. 43T is used most commonly for general textile printing. Please note that we use the European system therefore mesh counts is threads per cm, sometimes you may see the American system being used which is threads per inch.Read our online buyers guide – page 15 for a breakdown of each count and their ideal use. What is the difference between Yellow and White mesh? Generally speaking there is very little difference in the performance of the mesh unless you are using 90T upwards. Yellow mesh absorbs more light and stops light scattering, this helps expose those very fine lines and intricate details. We use Italian mesh yellow and white, they are great for fine halftones with high resolution and has the greatest possible exposure latitude with unsurpassed protection against light-undercutting. After I wash my shirts a few times, the ink starts to come off. This means that you have not cured your garment correctly. Plastisol inks need to be heated to a pre-determined temperature for a certain duration of time, usually somewhere between 45-60 seconds. This would be to either to flash dry or to use a conveyor dryer. Different inks, or special garments may need their timing fine tuned. The temperature and times will vary some job to job, so always do a wash test. A great way to test to see if the ink is cured or not is to pull on the t-shirt. 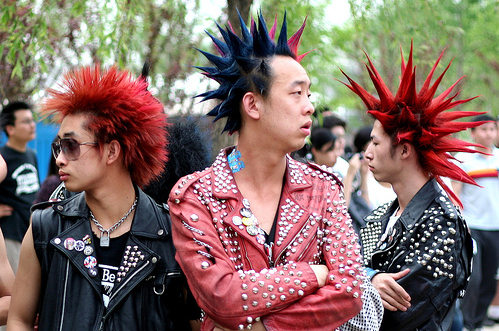 If the ink sticks together like plastic or rubber, then it is cured. However if it cracks and you can see the t-shirt under it, you need to increase your curing time. via Wicked Printing Stuff, your home for screen printing equipment and supplies – FAQs. When using products PLEASE check the safety sheets, here is the link. Wicked Printing Stuff, your home for screen printing equipment and supplies – Links. Here you will find a link to all of our product data safety sheets for our inks and solvents that we supply. Please make time to read this and familiarise yourself with the information contained within these documents before you use the products. 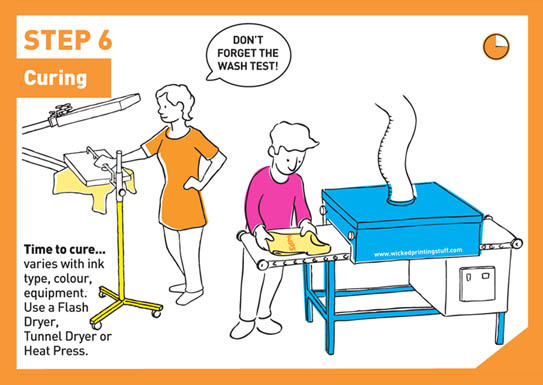 via Dummies Guide to Screen Printing | Wicked Printing Stuff. 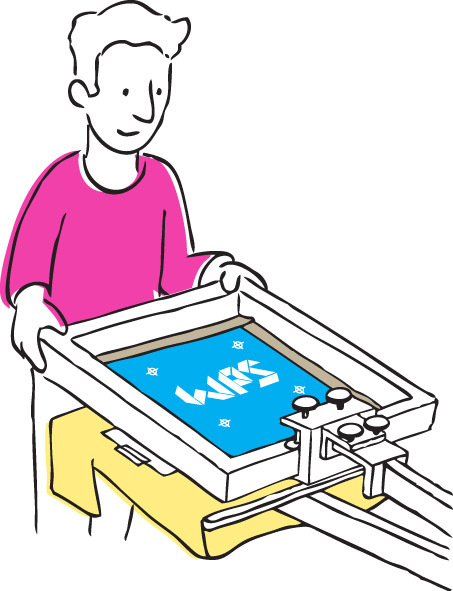 When you have finished your screen print run there are a number of next steps. If you plan to use the design again then you need to wash the screen down. This will remove the ink from the screen but leave the exposed image. If your ink is water based a simple hose down is sufficient but a solvent ink will need screen wash. Make sure to use the right process for the ink involved. ‘Reclaiming’ is the act of striping the stencil from your screen in order to create a new stencil and start the printing process over again. If you are not going to print a design any more it’s time to reclaim your screen so that you can use them for something new. Remove all tape from the mesh. Apply stencil strip with a cloth to both sides of the screen. Using a power washer to clean the screen thoroughly on both sides. Your screen is ready for reuse. If there is still an image left on the screen this is called ‘ghosting’, this is an example of a screen with ghosting. If there is any ghosting of the screen you can use a ghost remover / haze paste to remove them. Haze Paste remover is a great solution if you have any ghosting left on your screen which is common when using waterbased inks as they dye the mesh. Our range includes the premium MacDermid Autohaze will deals with the most stubborn stains. The finished screen after using this product Haze Paste..